Filter is certainly known by half of Budapest. After the cultic Leisure Centre closed on Almássy square, just a few meters away from Filter, the pub took its place, and since then it tries to maintain its spirit wrapped in a more modern context. 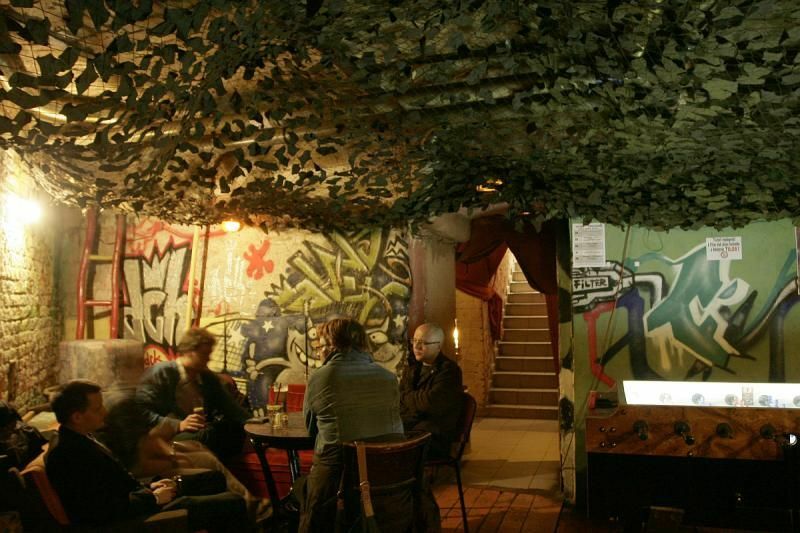 The basement meets all the requirements of a ruin pub with its lights, the colorful furniture, the exhaust pipes and the camouflage net all along the ceiling. The graffities easily direct you to the bar, where there are constant discounts for the thirsty guests. If there is one more thing inherited from the former Leisure Centre, then it’s the music genre for sure: Filter is one of the most important meeting point for the local rock scene, there are many beginner bands performing here as well. Beside rock concerts, there are new wave parties, house party nights, indie, brit pop and dub selections for the various audience of the place. Filter is still a good choice if you just want to sink into a big old armchair and chat with your friends. There is also table football if you prefer to do something sports-like.